Last month, we had a French postcard series on every Saturday. From today on, we will focus on Great Britain. We start today with a post on a Real Photo (Picturegoer) series called 'Film Partners', published in the 1930s in London. The postcards have either horizontal or vertical formats. Some are in black-and-white; others are hand-coloured. And yes, this was the United Kingdom in the 1930s, so all the couples are strictly male/female. 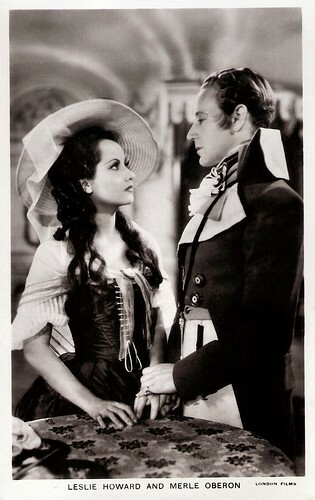 Leslie Howard and Merle Oberon. British postcard in the Film Partners Series, London, no. P 150. Photo: London Films. Publicity still for The Scarlet Pimpernel (Harold Young, 1934). 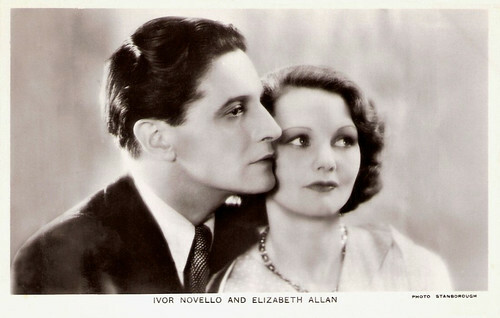 Ivor Novello and Elizabeth Allan. British postcard in the Film Partners series, London, no. P 41. Photo: Stanborough. Publicity still for The Lodger (Maurice Elvey, 1932). Jack Hulbert and Cicely Courtneidge. British postcard in the Film Partners Series, no. P 42. Photo: Gainsborough Pictures. Publicity still for Jack's the Boy (Walter Forde, 1932). 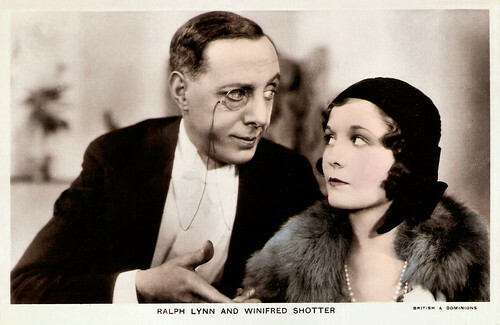 Ralph Lynn and Winifred Shotter. British postcard in the Film Partners series, London, no. 81. Photo: British & Dominions. Publicity still for Summer Lightning (Maclean Rogers, 1933). 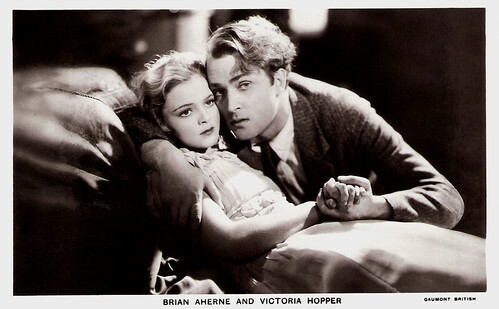 Brian Aherne and Victoria Hopper. British postcard in the Film Partners series, no. P 121. Photo: Gaumont-British. Publicity still for The Constant Nymph (Basil Dean, 1933). Leslie Howard and Heather Angel. British postcard in the Film Partners Series, London, no. P 123. Photo: Fox. Publicity still for Berkeley Square (Frank Lloyd, 1933). 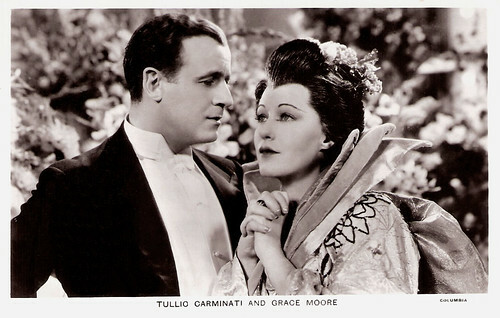 Tullio Carminati and Grace Moore. British postcard in the Film Partners Series, London, no. P 151. Photo: Columbia. Publicity still for One Night of Love (Victor Schertzinger, 1934). 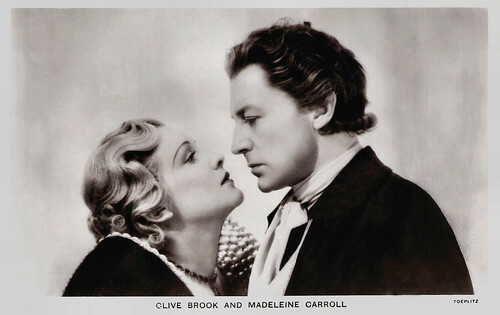 Madeleine Carroll and Clive Brook. British postcard in the Film Partners series, no. P 166. Photo: Toeplitz. Publicity still for The Dictator (Victor Saville, 1935). 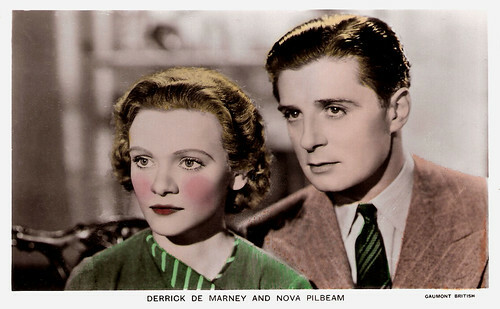 Derrick De Marney and Nova Pilbeam. British postcard in the Film Partners Series, no PC 236. Photo: Gaumont British. Publicity still for Young and Innocent/The Girl Was Young (Alfred Hitchcock, 1937). Jack Hulbert and Patricia Ellis. British postcard in the Film Partners Series, London, no. P 241. Photo: London Films. Publicity still for Paradise for Two/Gaiety Girls (Thornton Freeland, 1937). 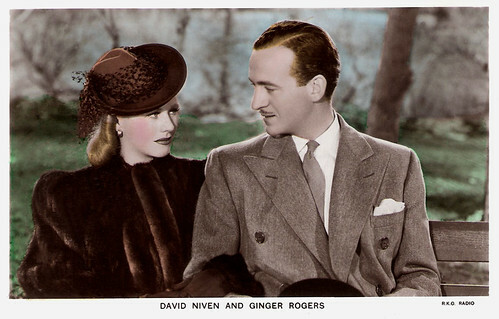 David Niven and Ginger Rodgers. British postcard in the Film Partners Series, London, no. PC 211. Photo: R.K.O. Radio. Publicity still for Bachelor Mother (Garson Kanin, 1939). Barry K. Barnes and Valerie Hobson. British postcard in the Film Partners Series, no. PC 284. Photo: Paramount British. Publicity still for This Man in Paris (David MacDonald, 1939). Oh, my goodness! These are wonderful...and inspiring. I adore that time in history and often use old postcards for reference when I do my artwork. Once again, I am in awe of the work you put into your blog, Paul.